The reverberator System object™ adds reverberation to mono or stereo audio signals. Create the reverberator object and set its properties. reverb = reverberator creates a System object, reverb, that adds artificial reverberation to an audio signal. reverb = reverberator(Name,Value) sets each property Name to the specified Value. Unspecified properties have default values. Example: reverb = reverberator('PreDelay',0.5,'WetDryMix',1) creates a System object, reverb, with a 0.5 second pre-delay and a wet-to-dry mix ratio of one. Pre-delay for reverberation in seconds, specified as a real scalar in the range [0, 1]. Pre-delay for reverberation is the time between hearing direct sound and the first early reflection. The value of PreDelay is proportional to the size of the room being modeled. Lowpass filter cutoff in Hz, specified as a real positive scalar in the range 0 to (SampleRate2). Lowpass filter cutoff is the –3 dB cutoff frequency for the single-pole lowpass filter at the front of the reverberator structure. It prevents the application of reverberation to high-frequency components of the input. Density of reverb tail, specified as a real positive scalar in the range [0, 1]. Diffusion is proportional to the rate at which the reverb tail builds in density. Increasing Diffusion pushes the reflections closer together, thickening the sound. Reducing Diffusion creates more discrete echoes. Decay factor of reverb tail, specified as a real positive scalar in the range [0, 1]. DecayFactor is proportional to the time it takes for reflections to run out of energy. To model a large room, use a long reverb tail (low decay factor). To model a small room, use a short reverb tail (high decay factor). High-frequency damping, specified as a real positive scalar in the range [0, 1]. HighFrequencyDamping is proportional to the attenuation of high frequencies in the reverberation output. Setting HighFrequencyDamping to a large value makes high-frequency reflections decay faster than low-frequency reflections. Wet-dry mix, specified as a real positive scalar in the range [0, 1]. Wet-dry mix is the ratio of wet (reverberated) to dry (original) signal that your reverberator System object outputs. audioOut = reverb(audioIn) adds reverberation to the input signal, audioIn, and returns the mixed signal, audioOut. The type of reverberation is specified by the algorithm and properties of the reverberator System object, reverb. Audio input to the reverberator, specified as a column vector or two-column matrix. The columns of the matrix are treated as independent audio channels. Audio output from the reverberator, returned as a two-column matrix. Use the reverberator System object™ to add artificial reverberation to an audio signal read from a file. Create the dsp.AudioFileReader and audioDeviceWriter System objects. Use the sample rate of the reader as the sample rate of the writer. Play 10 seconds of the audio signal through your device. Construct a reverberator System object with default settings. Construct a time scope to visualize the original audio signal and the audio signal with added artificial reverberation. Play the audio signal with artificial reverberation. Visualize the audio with reverberation and the original audio. The algorithm to add reverberation follows the plate-class reverberation topology described in  and is based on a 29,761 Hz sample rate. The algorithm has five stages. The description for the algorithm that follows is for a stereo input. A mono input is a simplified case. A stereo signal is converted to a mono signal: x[n]=0.5×(xR[n]+xL[n]). A delay followed by a lowpass filter preconditions the mono signal. The pre-delay output is determined as xp[n]=x[n−k], where the PreDelay property determines the value of k.
fc is the cutoff frequency specified by the HighCutFrequency property. fs is the sampling frequency specified by the SampleRate property. The signal is decorrelated by passing through a series of four allpass filters. For AP1, k = 142. For AP2, k = 107. For AP3, k = 379. For AP4, k = 277. The signal is fed into the tank, where it circulates to simulate the decay of a reverberation tail. The following description tracks the signal as it progresses through the top of the tank. The signal progression through the bottom of the tank follows the same pattern, with different delay specifications. The new signal enters the top of the tank and is added to the circulated signal from the bottom of the tank. β is the coefficient specified by the Diffusion property. k is the variable delay specified by a 1 Hz sinusoid with amplitude = (8/29761) * SampleRate. To account for fractional delay resulting from the modulating k, allpass interpolation is used . φ is the coefficient specified by the HighFrequencyDamping property. k is set to 1800 for the top of the tank and 2656 for the bottom of the tank. The signal is delayed again and then circulated to the bottom half of the tank for the next iteration. A similar pattern is executed in parallel for the bottom half of the tank. The output of the tank is calculated as the signed sum of delay lines picked off at various points from the tank. The summed output is multiplied by 0.6.
where the WetDryMix property determines κ.
 Dattorro, Jon. "Effect Design, Part 1: Reverberator and Other Filters." Journal of the Audio Engineering Society. Vol. 45, Issue 9, 1997, pp. 660–684. Dattorro, Jon. 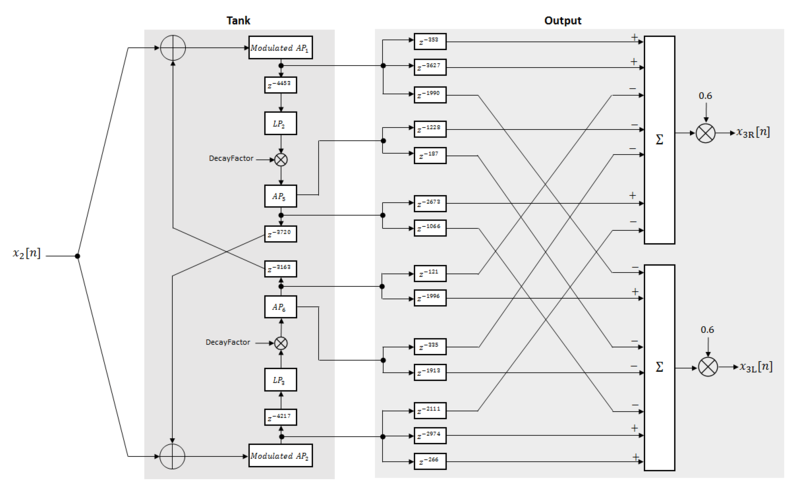 "Effect Design, Part 2: Delay-Line Modulation and Chorus." Journal of the Audio Engineering Society. Vol. 45, Issue 10, 1997, pp. 764–788.